Have you ever looked star gazed at the wall of color chips? Try Miller Paints Virual Painter. Upload a picture of your room or house and paint the wall with one of Miller's colors. 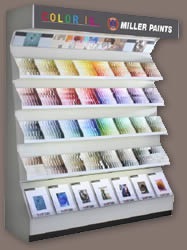 You will have fun experimenting and can choose your paints from the comfort of your home. Industry Leader in spray equipment and accessories. Quality sprayers for the home owner and the professionals.